Vindaloo is an Indian dish. The term Vindaloo derives from the Portuguese dish "Carne de Vinha d' Alhos", a dish of meat, usually lamb, with wine and garlic. Alternate terms are Vindalho or Vindallo. "Carne de Vinha d' Alhos" was first brought to Goa by the Portuguese and became a Goan meal often served during special occasions. The traditional Portuguese dish was made with pork preserved in red wine or red wine vinegar, chili pepper, and stewed with garlic. The dish evolved into the Vindaloo curry dish when it received the Goan treatment of adding plentiful amounts of spice. Restaurants often serve this dish with chicken or lamb sometimes mixed with potatoes. 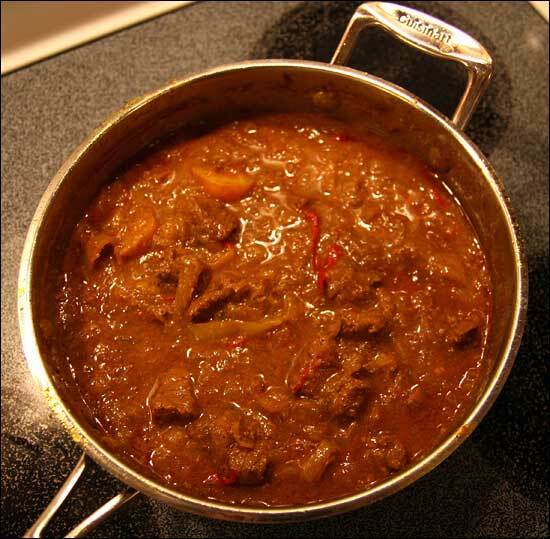 Vindaloo is not common or popular in most places in India, excluding Goa. The dish has gained popularity in Britain, the Middle East, Canada, Australia and New Zealand, where it is almost universally featured on Indian restaurant menus; it is also sometimes found at Indian restaurants in the United States. It is one of the hottest dishes available on the menu where it is served, although some establishments serve a "Tindaloo" in addition, which is a hotter variant. The popularity of the dish inspired the song "Vindaloo", the unofficial anthem of the England football team for the 1998 FIFA World Cup and it was prominently mentioned in the 1978 punk rock song, I Just Want to Have Something To Do, by American punk rock group the Ramones.